Sofia, Bulgaria’s capital and largest city, lies at the foot of Vitosha Mountain in the western part of the country. The city’s landmarks reflect more than 2,000 years of history. Additionally, many of the buildings are from the Bulgarian Revival in the late-19th century. This is the time when Bulgaria reclaimed its independence from the Ottomans. There are many places to visit in Sofia during your stay. And not to forget that Sofia is only 3 hours away from Skopje with the best fares from Skopje Taxi. 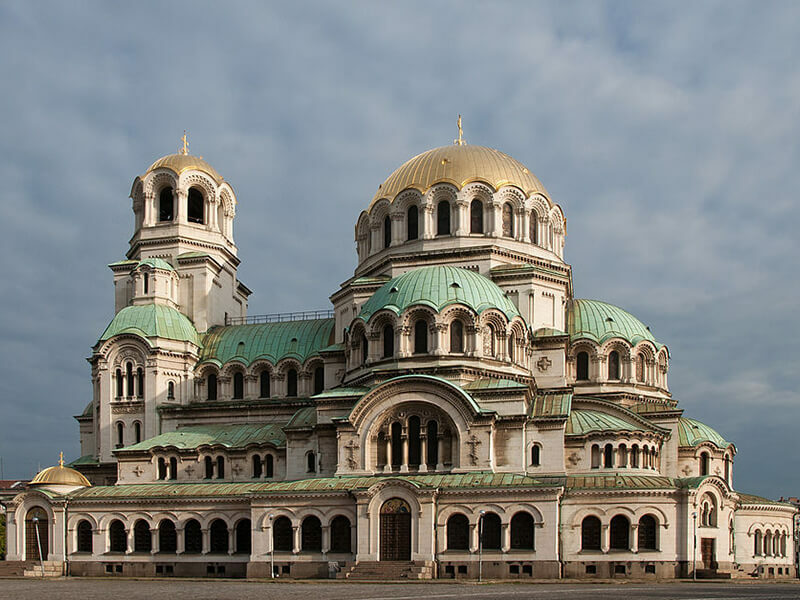 One of the most famous places to visit in Sofia is this very cathedral. The scale of this building will blow you away. Firstly, the inside of St Alexander Nevsky has room for 10,000 people. Therefore, it’s the second largest cathedral in the Balkan region. As with a great deal of Sofia’s grand architecture, the city’s cathedral dates to the 1880s. When you’re inside, look up at ceiling of the main cupola. It has a mural of the Lord God Sabbath. The crypt here is open to visitors and has a big collection of icons. 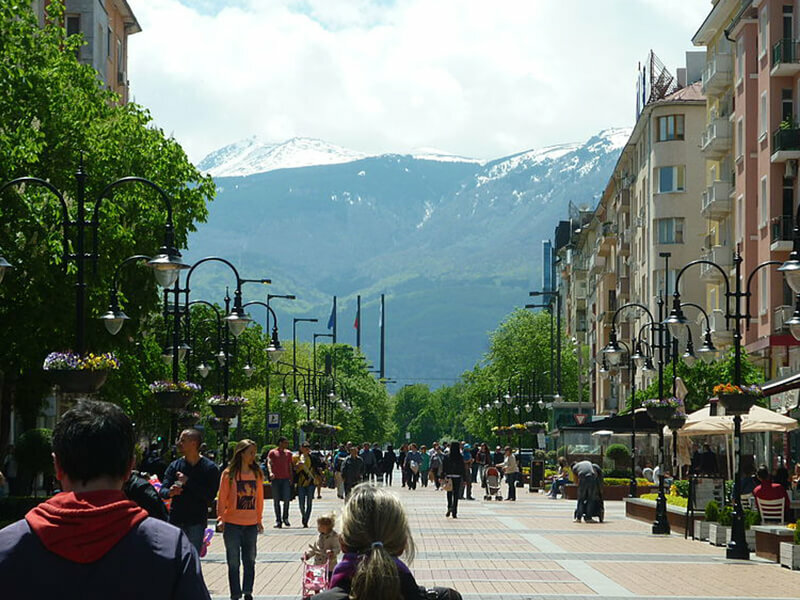 The fanciest street in the city, Vitosha Boulevard is where you’ll find all the posh boutiques and fashion houses. Generally, it’s a pleasant place to spend a couple of hours. The cafes along the pedestrian street have outdoor seating. Recently, the lampposts, benches and kiosks have been redesigned into an elegant art nouveau style. This represents the early years of the Bulgarian Revival. Climbing to more than 2,200 metres behind Sofia’s southwestern suburbs is Vitosha. 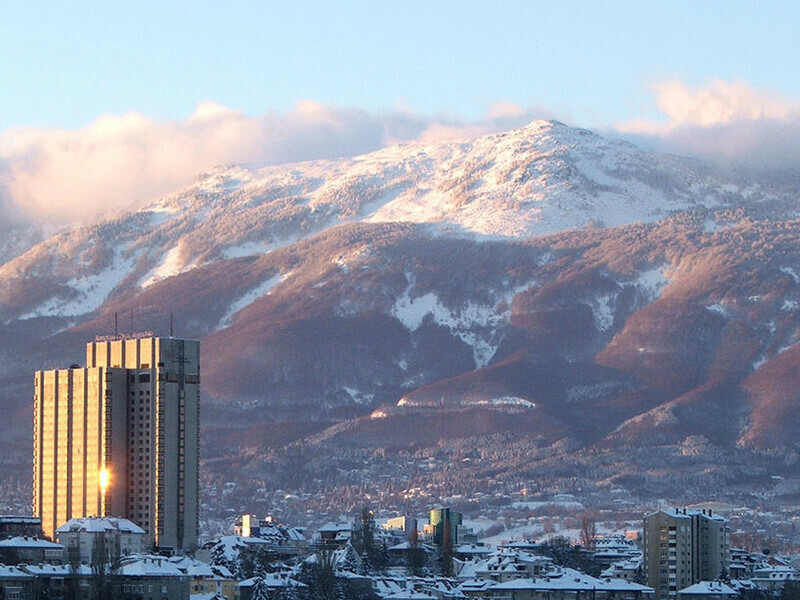 The easiest way to access Vitosha is via Aleko, the mountain’s ski resort. That’s where the Simeonovo gondola lift will drop you off. From there the walk to Vitosha’s Black Peak is surprisingly light when then weather’s good in spring or autumn. The peak is part of a large plateau that seems to go on forever thanks to its shallow gradient. You don’t need to go far for an incredible, vertiginous view of Sofia. Another one on the list of places to visit in Sofia is the National Historical Museum. This museum’s home is also a piece of Bulgarian history in its own right. 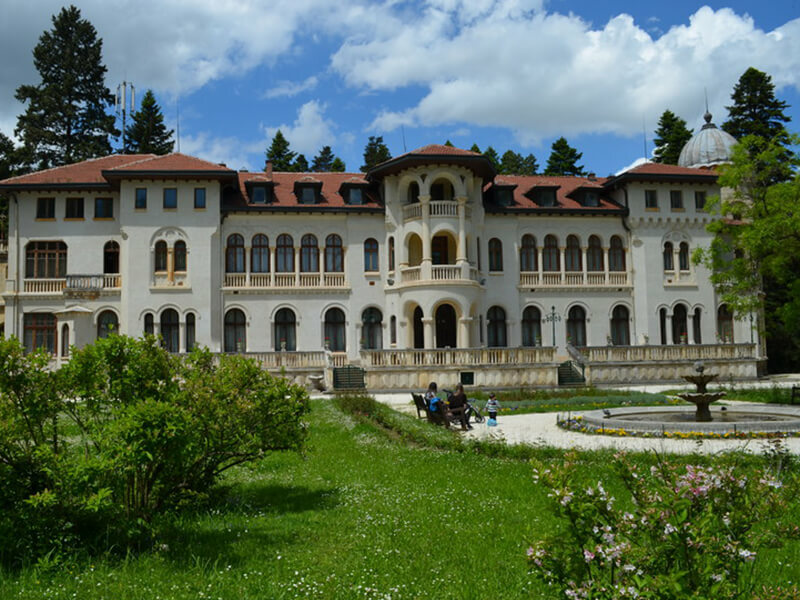 The National Historical Museum is actually the former dictator Todor Zhivkov’s residence. 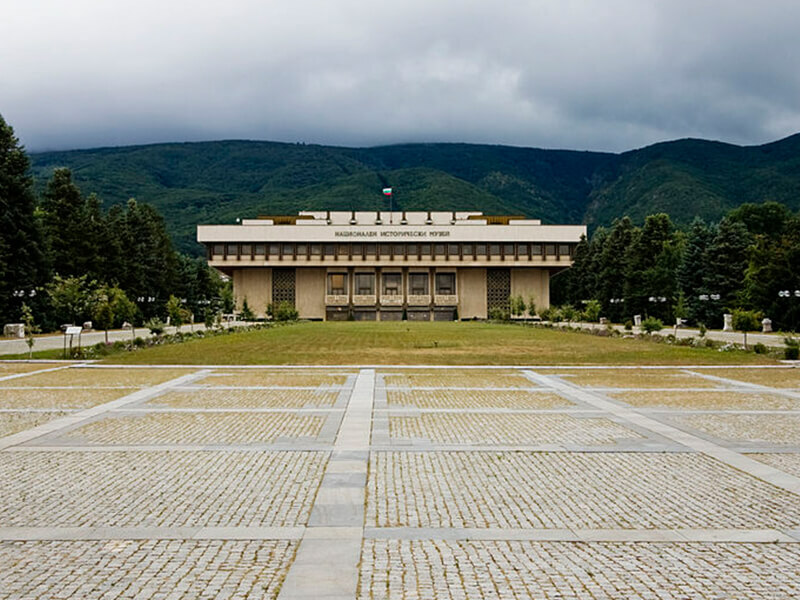 It’s a hulking slab of Stalinist architecture fronted by a massive open yard. The collection at the museum is gigantic. Hence the 65,000 items on display is just one tenth of what’s in its archives. The variety of items goes from 20th-century space research equipment to treasures belonging to the Odrysians. The Viennese architects Helmer & Fellner built this theater in 1909. 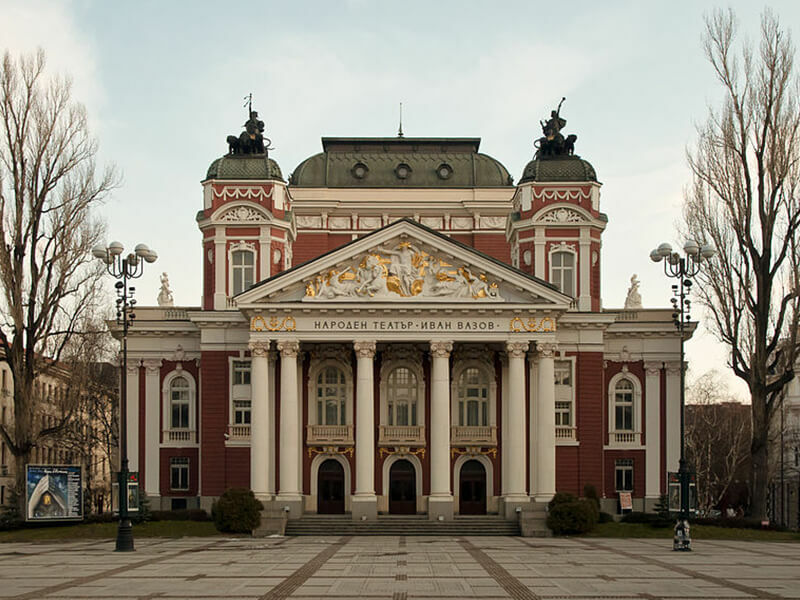 True to form, the Ivan Vazov National Theatre is a grand neoclassical structure. The building with its towering portico is an iconic sight for Bulgaria. It’s most famous for its drama productions and you can also see it in banknotes. 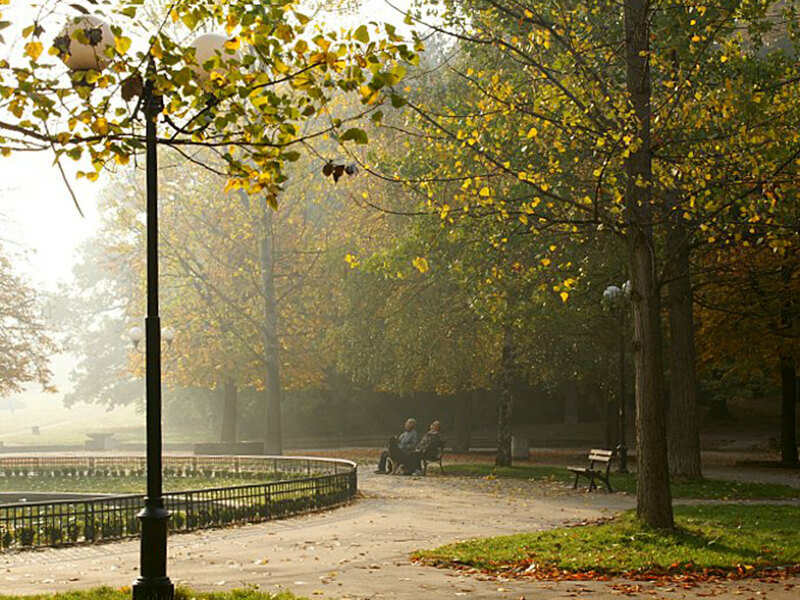 Sofia’s most famous park Borisova Gradina dates to the 1880s. It’s the oldest one in the city, developed over the next 50 years by three different designers. The Swiss Daniel Neff, the Alsatian Joseph Frei and then the Bulgarian Georgi Dutev. But what’s impressive is that all the landscapers worked within the original plan. The upshot is a pleasing sense of coherence for such a big project. It all makes for a refreshing afternoon amble. If you’re in Sofia on a summer evening there are free concerts to catch. Sofia’s own Roman amphitheater, the Serdica Amphiteater, wasn’t discovered until 2004. In its day it was one of the largest in the Roman empire. It held gladiator fights and grisly battles, pitting men against wild beasts. First it was a theater, then an amphitheater that was sacked by the Goths. In the 400s the arena was rebuilt, but was abandoned not long after. 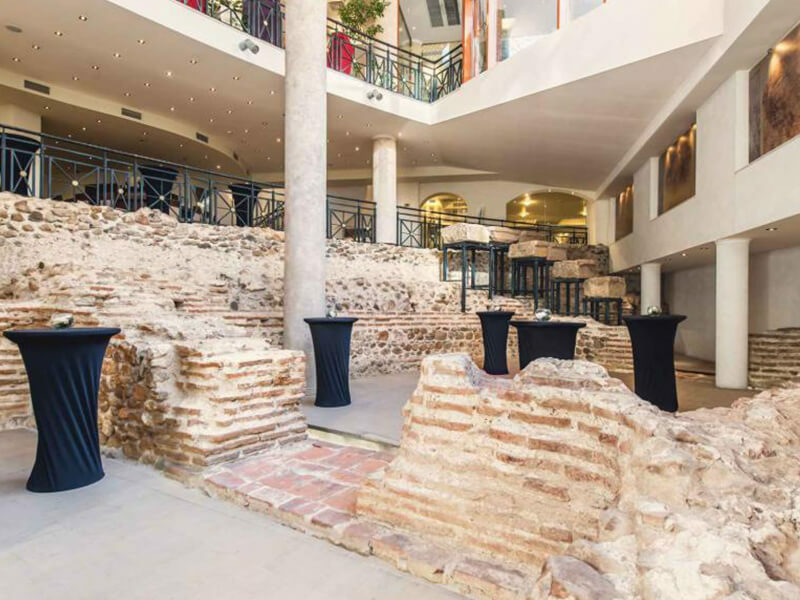 After it was unearthed it became integrated into the design of the Arena di Serdica hotel. Visitors off the street are free to look down at the ruins from the hotel’s specially-designed gallery. 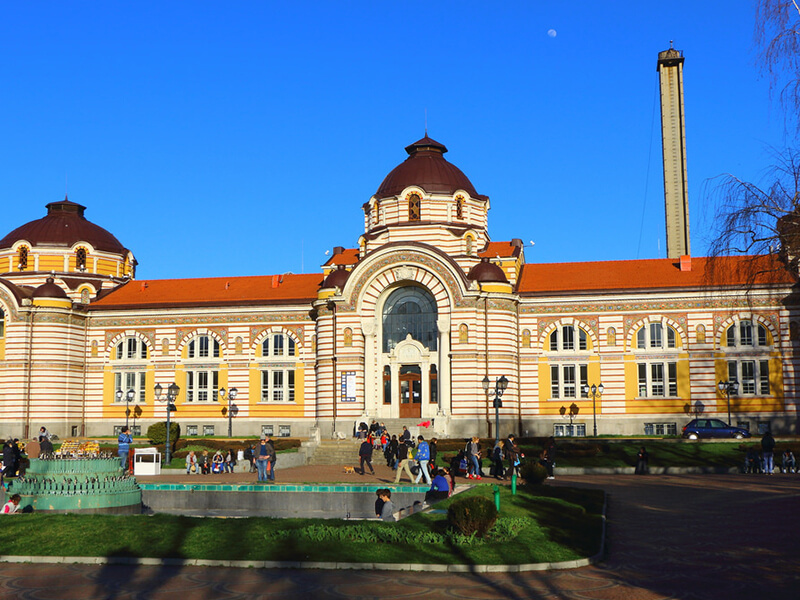 The Central Mineral Baths are another one of the most famous places to visit in Sofia. Sofia has a lot of spring activity, and these waters have drawn visitors since medieval times. The Ottomans developed their own hammam at this site. When it fell down following the Bulgarian Revival, a new city bathing complex took place. The Central Baths date to 1913 and were in use up until the mid-80s. It’s one of Sofia’s most photographed buildings, constructed in the neo-byzantine style with a large dome behind an impressive vestibule. The gardens are open to the public and the fountain at the centre is fed by the hot natural mineral water. Park Vrana is on the grounds of the stately home of the aristocrat Simeon II. He was Tsar of Bulgaria from 1943 until 1946, before going into exile. After returning, he was prime minister from 2001 until 2005. The estate is only open on weekends and you can’t enter any of the buildings. The landscaped gardens are one of the most tranquil settings in Sofia. Multilingual guided tours take place every hour and offer fun snippets about the palace and its grounds. The estate once had an exotic menagerie, including Bulgaria’s first elephants. 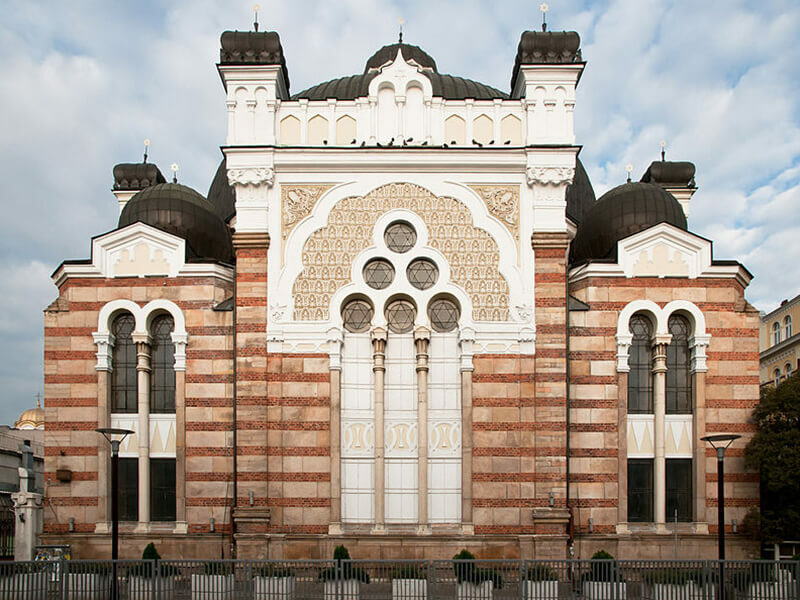 Sofia has the largest synagogue in the Balkan region, and the third-largest in Europe. It was built for Sofia’s sizable Sephardic Jewish population in 1909. More than 1,000 people can fit inside this cavernous building. The building itself is in the Moorish Revival style, inspired by the old Sephardic temple in Vienna. Sofia Synagogue holds an exhibition about the history of Bulgaria’s Jewish communities. 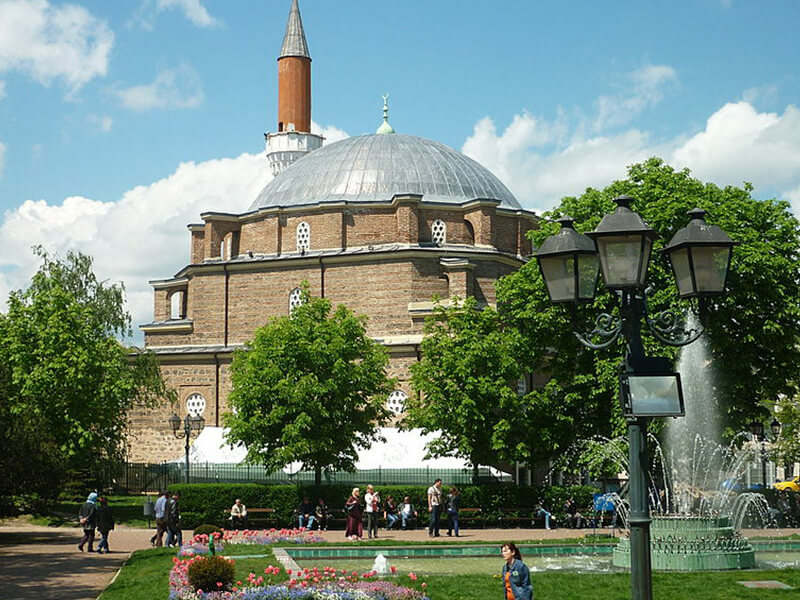 Last but not least, one of the places you should visit in Sofia is the Banya Bashi Mosque. If you arrive outside prayer times you can drop in to tour Sofia’s only mosque. It was designed by Mimar Sinan, the epoch-defining Turkish architect responsible for spectacular works across the Ottoman Empire. Banya Bashi is from 1576, built at the very beginning of the city’s Ottoman period. The name comes from Sofia’s mineral baths, which had attracted visitors throughout the region during the 1500s. The mosque can fit 700 worshipers. If you pass on Fridays you’ll notice many stragglers outside listening via the mosque’s external loudspeaker. Hope you enjoy our list of 11 places to visit in Sofia and we wish you a pleasant stay! If you’re heading over to Prishtina, we have another list of places you should visit in Prishtina.